perceptionsense: More Perception Findings at Disney! More Perception Findings at Disney! Continuing with my other blog about Perception in Disney, I found more places where perception can be found in Walt Disney World. Cinderella's Castle is actually an Illusion! Cinderella Castle was completed in July 1971, after about 18 months of construction, and reaches to a height of 189 feet (58 m) tall, measured from the concrete bottom of the moat, which itself is 6 feet (1.8 m) deep at the drawbridge. Cinderella Castle is more than 100 feet (30 m) taller than Sleeping Beauty Castle at Disneyland in Anaheim, California. An optical trick known as forced perspective makes the Castle appear even larger than it actually is. As it becomes taller, its proportions get smaller. For example, using this method, the top spire of the Castle is actually close to half of the size it "appears." Major elements of the Castle were scaled and angled to give the illusion of distance and height, a method frequently used in Disney theme parks around the world.. It has long been rumored that the ballroom scene, which features multiple ghosts merrily carousing, was created with holograms. This is not the case: the ability to create a hologram of that complexity was not available when the attraction was initially designed in the late 1960s. In fact, the Ballroom uses a visual trick developed in the 1860s to show realistic ghosts in theatrical productions: Pepper's Ghost. In the Pepper's Ghost illusion, there are two identical rooms separated by clear glass. One is kept dark and is not visible to the audience, but it contains the item which is to appear in a ghostly manner in the visible room. When it is illuminated, the item will be reflected in the glass and will "appear" in the visible room. The audience sees only the reflection, which can interact with whatever is in the visible room (a keyboard, a swordsman, etc). In the Haunted Mansion's ballroom scene, the extra rooms to create the Pepper's Ghost illusion, which contain the solid forms of the figures you're seeing, are hidden above and below the Doom Buggy track. Many guests do not notice the sheet of glass between the Buggies and the ballroom. It's one of the reasons that the Ghost Host requests that guests refrain from flash photography. 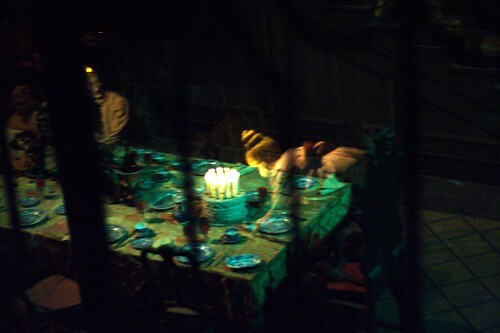 "Ghost" blowing out candles in the Haunted Mansion.